I found this tiny(absolute tiny) and wonderful utility for windows mobile. It uses top 2 pixel row of your screen and shows you the battery as well as memory status. 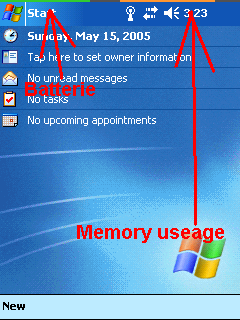 A quick look at the phone will give you an idea that how much battery is remaining and if you have enough memory free or not.